Solar activity was low for the last several days. 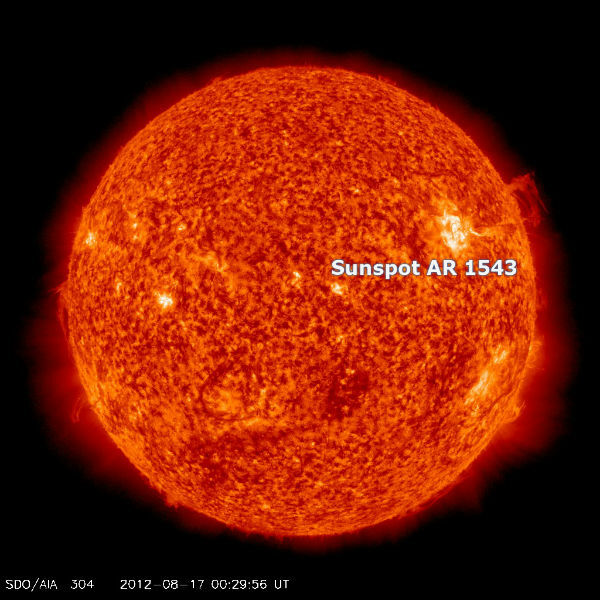 Sunspot Region 1543 produced a long-duration C3 flare at 13:16 UTC on August 16. This flare was accompanied by Type II (704 km/s) and Type IV radio emissions and a coronal mass ejection (CME). Type II emissions occur in association with eruptions on the sun and typically indicate a coronal mass ejection is associated with a flare event and Type IV emissions occur in association with major eruptions on the sun and are typically associated with strong coronal mass ejections and solar radiation storms. The CME was first visible in STEREO-A COR2 imagery and was estimated to be moving at around 330 km/s. Analysis is underway to determine if it will be geoeffective. A weak impulse was indicated at several geomagnetic observatories at around 13:21 UTC. Earlier, the Bz component of the interplanetary magnetic field at the ACE spacecraft turned southward to approximately -6 nT. It remained mostly southward. The shift in Bz and the subsequent impulse at earth were consistent with the arrival of the CME from 13 August. The disturbed conditions around August 17-18 are expected with the arrival of the CME from August 14. The disturbed conditions on August 19 are expected with the arrival of a positive coronal hole high-speed stream. Region 1543 ended the period as a Hhx group with alpha magnetic characteristics. New Region 1546 (N16E69) was numbered today as a simple Hsx group. There is a slight chance for an M-class flare around August 19, as old Sunspot Region 1532 returns. NOAA/SWPC forecasted 5% possibility of M-class event.